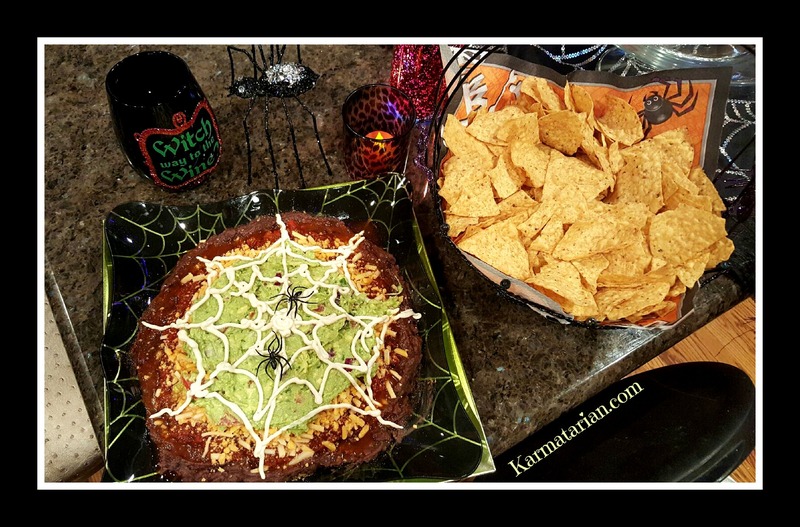 Pinterest Inspired Spooky Smokey Spider Dip. Ha! That’s a tongue twister. If you are need a fun appetizer for your Halloween festivities this weekend, you really have to try this 5 minute dip! It’s about 5 minutes after you fumble around filling your cake decorator pouch with the vegan sour cream… You can always use a parchment paper cone! It’s also only 5 minutes if you have pre-made your guacamole or are using store bought. It’s up to you! I love how the flavors came together on this one. So, do exactly as I say. Lol… ok, I just wanted to say that. Do whatever you want. Use your favorite salsa and vegan cheese but if you can trust me and my suggestions… you will like this! It’s just different enough that it’s not another regular old 5 layer dip.. blah blah blah. The salsa that I like gives this that spookiness… I mean smokiness. White Wine Vinegar, 1 to 2 tsp. Start with one. Add the undrained tofu to a high power blender, add the other ingredients minus the salt and agave. Blend, taste and adjust seasonings. I like to add a pinch of salt and a drop or two of agave just to round things out. See what you need. This should have a nice tang, like traditional sour cream. Add your sour cream to the cake decorating bag with a small writing tip or use a parchment paper cone. See above. Spread a full can of refried black beans into a nice flatish circle on the platter. Next, sprinkle some cumin, chili powder and sea salt… I just guessed it. You can also mix the beans with the spices first and taste and adjust before spreading, but I was feeling too lazy for this. Next, spoon the salsa over the beans and spread it out being sure to still see the beans around the edge. Then, over the salsa sprinkle the shredded vegan cheese, being sure to still see a salsa edge. Spoon the guacamole in the center and spread out, being sure to see the cheese layer (I’m sure by now you get that each layer is smaller). Last, take your cake decorator tube and draw your lovely spider web. Start in the center and draw your spider web. Top with the spiders, serve with chips and have a spooktacular time! My Notes: I found this dip on Pinterest, here is the recipe but it doesn’t look like the original. It seems the original was lost in translation. That’s a shame. If you know it, let me know so I can give proper credit. Of course I veganized this and made it my own, which is always fun to do! The new Mexican style shreds are great for this dip but don’t try in a quesadilla :( we were sorely disappointed with the drippy mess. We prefer Daiya for those. I made this for Taco Tuesday this week and I should of heated the beans first, because it was for our family that planned to eat it right away. For the party, I didn’t bother heating it up, because dips sit around a while anyway. This is a guess regarding how much of each ingredient. Make it to your liking and most of all, have fun with it. This idea seemed a bit over done to me, but I did it anyway, and I’m glad. It was a hit at our pumpkin carving party this year! My summer was very busy, sprinkled with a little bit of fun and unfortunately a little bit of stress. I was hoping things would slow down so I could find time to blog. No such luck on the slowing down thing. What I was really waiting and hoping for was a little inspiration which came in time for Labor day. Funny, I realize my last article was written for Memorial day. I don’t plan these things, but I guess I did however unintentionally take the summer off from blogging. I’m back and hoping your summer was a great one! It was time for my son’s 3rd birthday party mid August which kind of feels like the end of summer for us. I had a blast planning his Thomas the train birthday bash and I was very inspired by this super EASY appetizer dip I made. I can’t take total credit as my girlfriend Carrie gave me the original recipe a few years ago and I’m not sure where she got it. I never thought I would enjoy this one again, but I Veganized it my friends!!! I’m happy to report it was a total hit, the first dip devoured, and if you make it, be prepared for everyone to ask you what’s in it. I almost didn’t want to tell anyone, especially those omnivores who just don’t get it yet, but I did anyway, for the shock value of course! This dip is really delicious and the flavors were just meant to be combined together! Side note: I am not a huge fan of processed foods, especially soy products which are not organic. However, making a dip for a party doesn’t happen everyday and moderation is key. This dip sure beats the alternative… cruelty to animals, planet and your arteries! Wheat Thin Crackers. These are the original recipe cracker of choice but now I like Trader Joe’s version which has simpler ingredients and similar flavor.